Review In A Nutshell: Starry Eyes is a really fun contemporary read with great and realistic relationships and amazing writing. Starry Eyes follows Zorie, a teenaged girl who loves to be in control and plan things out. However, she’s completely thrown when she gets abandoned by her friends in the middle of a National Park when she was supposed to be “glamping”. What makes it worse? She’s stuck with Lennon, the boy across the street who she has a not-so-great history with. And now she has to rely on him to make it back home. This book is a great read. The pace is fast, despite all the hiking that goes on. Jenn Bennett does a wonderful job establishing the setting, playing with the beauty and the danger of nature. You feel like you’re in the caves and the redwoods with Zorie and Lenon. The writing is also relatable and hilarious at times. I loved the initial description of Lennon and the description of his moms. Speaking of moms, yay LGBT characters (there are even mentions of the homophobia they deal with which is awesome)! They may be side characters, but whatever I love them so much and I wish I could be like them. All of the characters in this book are amazing. They are well-developed, interesting, and so fun. I couldn’t even fully hate the people who left Lennon and Zorie behind because you can see the struggle they’re going through (but I did hate them a little bit because come on that’s really not cool). Lennon and Zorie themselves are such fun characters, each unique and in no way the cookie-cutter YA protagonist and love interest. I loved how Zorie develops across the book, and how strong she becomes. The family relationships in this book were amazing and real. I’ve talked about Lennon and his moms, but I also love Zorie and her stepmother, Joy. Their relationship was so fantastic. Also, the romance in this book is absolutely adorable. Jenn Bennet is officially one of my go-to authors for swoon-worthy YA romance now. I can’t wait to see what she writes next! Cons– I honestly now just want a book about Lennon’s moms. 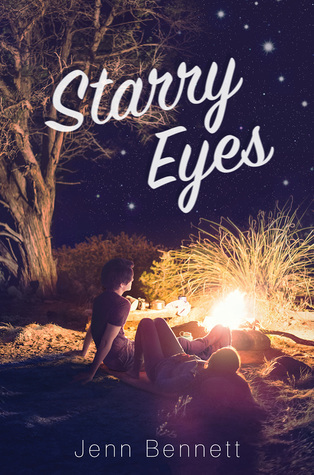 Starry Eyes is a great read for anyone looking for great contemporary romance!